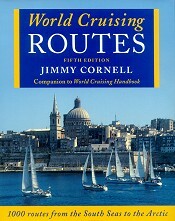 World Cruising Routes, 5th edition, by Jimmy Cornell. Hard cover, excellent condition book. $20 plus shipping or pick up from Tampa area. When do you want/need it? I will be returning to Canada in early April. Perhaps it's cheaper within the country? If you don't mind to hold it for me until then that would be much appreciated.